Now, Trelewicz-an assistant professor in the College of Engineering and Applied Sciences’ Department of Materials Science and Chemical Engineering with a joint appointment in the Institute for Advanced Computational Science at Stony Brook University and principal investigator of the Engineered Metallic Nanostructures Laboratory-takes advantage of the much higher magnifications of electron microscopes to see tiny nanostructures in fine detail and learn what happens when they are exposed to heat, radiation, and mechanical forces. 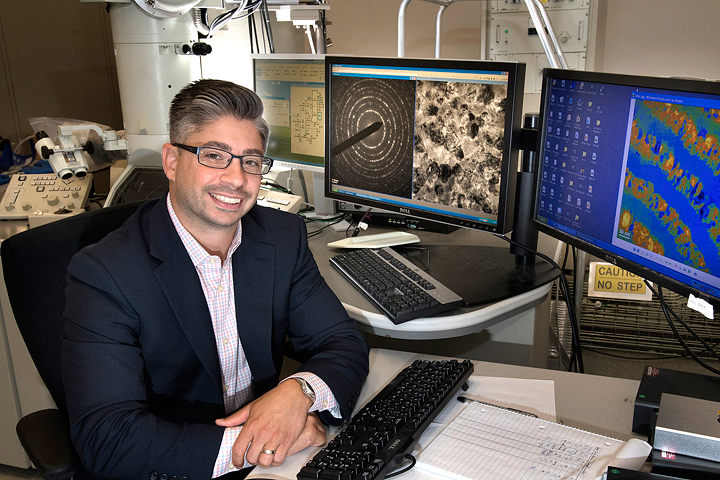 In particular, Trelewicz is interested in nanostructured metal alloys that incorporate nanometer-sized features into classical materials to enhance their performance. “All of our projects fall under the umbrella of developing new metal alloys with enhanced and/or multifunctional properties,” said Trelewicz. Trelewicz’s team is designing interfaces and engineering them into the metallic glasses-initially iron-based and later zirconium-based ones-to enhance the toughness of the materials, and exploring additive manufacturing processes to enable sheet-metal production.